Located 1.5 hours from South west of San Jose in the Town of Orosi in the province of Cartago. Panamerican or interamerican highway to Cartago, Highway 10 to Paraiso, Highway 224 to Paraiso. If you’re heading into Homestay or staying at the Guest House, please check in at the Otiac, our Tourist Information center. If you’re staying at the Hostel or have arrived and the Otiac office is closed for any reason, please check in at the hostel and they’ll direct you from there. Upon arrival into the San Jose area from the airport keep your eyes open for signs to Cartago. There are many different ways to get through San Jose and each depends upon your entry into San Jose. To get to Cartago you will need to leave San Jose heading in a southerly direction and will need to get on the highway once again after leaving San Jose downtown. This will take about 20-40 minutes. Once in Cartago continue in a southerly direction following signs to Paraíso and Orosi. Please remember that many roads in Cartago are one way roads and therefore need to take a right hand turn 2 blocks down and then once again to the left to get to the road that takes you directly out of Cartago and on the road to Paraíso. This trip takes 15 minutes. Once you arrive in the central area of Paraíso you will see signs to Orosi, and will need to turn right at the main crossroads in Paraíso. From here continue straight on this road for another 10 minutes, you’ll go down the mountain and see the valley in front of you. Once in town keep your eyes open for the soccer field with the large white church on your right hand side. Otiac is 3 blocks in the same direction. At the corner of the 3rd block turn right and one block in front of you is the OTIAC office. If If Otiac is not open please check in at the hostel and they’ll direct you from there. You can also arrive to Orosi by local public bus, but same day arrival depends upon your arrival time at the airport or bus schedules from other areas as there are no buses running to Orosi at late hours. 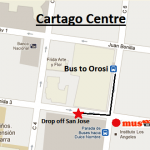 Remember that you will need to come into Cartago to catch the Orosi bus. Buses from the airport would be Alajuela to San Jose, San Jose to Cartago, Cartago to Orosi. This trip from the airport via bus should take about 2.5 to 3 hours depending upon traffic and bus schedules. Many people just choose the pickup option as doing these changes with luggage after a long flight can sometimes be very tiring. If you haven’t booked a pickup with us you can always take a local taxi at the airport, but be sure to ask for the price BEFORE entering the taxi! Needed buses run 7 days a week, about every 30 minutes from 8am-5pm. There is no need to buy bus tickets in advance. Orosi is easy to fit in your trip planning as most direct bus routes in Costa Rica run through San José and we’re just another 1.5 hours away. 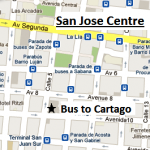 Take the “directo” bus to Cartago from the bus stop in San Jose located at “Avenida 10 and Calle 5” (300 metros sur de la CCSS), which leaves whenever it is full, usually between 10-20 minutes. 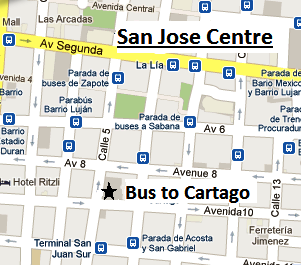 This bus will take you to Cartago and will take about 40 minutes. When in Cartago ask the bus driver to let you off “cerca de las ruinas” and from there walk to the Orosi bus stop, located on Calle 6 and Avenida 1. The bus to Orosi leaves approximately every 30 minutes weekly and every 45 minutes on Saturdays starting at 8 am and Sundays starting at 8:30 am. This trip takes 25 minutes and passes through the town of Paraíso along the way. Montana Linda Hostel: When in Orosi, ask the bus driver to let you off at the “Musmani” From there walk back a block to the “Bar La Primavera” which will be on your left-hand side. Turn left at this street and follow it 2 ½ blocks until it curves right and our sign will be right in front of you. 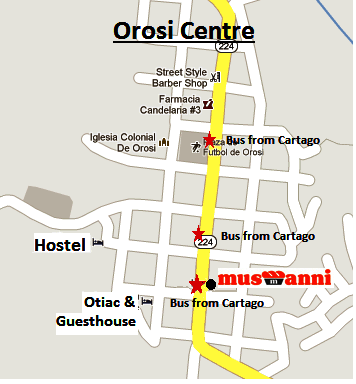 Otiac: When in Orosi, ask the bus driver to let you off at the “Musmani” From there walk “up” and turn right at the corner. Walk 1 block and you’ll see the “Otiac” building at the intersection. “Dragon Fly” Guest House: When in Orosi, ask the bus driver to let you off at the “Musmani”. From there walk “up” and turn right at the corner. Walk 1 block and you’ll see the “Otiac” building at the intersection. This is where you will check in for the guest house. If Otiac is not open please check in at the hostel and they’ll direct you from there. Avoid the switching of the buses with luggage that can sometimes make the first local bus trip awkward. Pickup’s can be organized for any day of the week and at any hour of the day, 24 hours a day. See prices area for more details and remember that the price is 1 way. How will you find us? Just look for a sign with our name on it upon leaving the airport! Yes… return trips to the airport are the same price. Prices are valid for Airport pickups only into Juan Santa Maria airport (airport code SJO) in Alajuela just 30 minutes outside of San Jose. Airport picks ups can be organized via email up to one week in advance. Less than 1 week please call the office directly with flight info including: Airline company, exact arrival date, arrival time, flight number and departure city. Please confirm that the information is for the last segment of your connecting flight. If you are arriving late it might be smart to have a pick up, if not you will need to spend the night in San Jose as there are no buses running to Orosi at late hours. If Sunday arrival for the Spanish school is bringing you in late we would suggest to change it to Saturday night to give you time to settle in before classes on the Monday. If your pickup is at a hotel in San Jose or another area in Costa Rica, your information can be phoned in once in Costa Rica up until 3 days prior. Pickups are charged based upon your pickup area and time of day. Would you suggest a rental car for the Orosi area? Most excursions are within walking, biking or taxi distance. Although a car rental is not necessary it is always nice as it will save you more time then biking and can be cheaper then a tour or taxi. How can I organize transport? PickUPS must be organized in advance but tours and transport back out of Orosi can only be organized once in Orosi. We do not book trips in advance except for airport pickup. Taxi prices are all based upon where it is that you are going, what the terrain is, how long the driver will have to wait for you and how many people are going. In general they are not very expensive and even cheaper if you can find other people to share the cost with. Just let the Otiac or Montaña Linda office know whenever you need help. Can I do day trips from Orosi? Day trips can be done but only within Orosi and surrounding areas. Although Orosi is located in the center of Costa Rica, it is still too big of a country to do the coasts in a day trip. 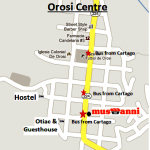 Orosi can be used as a travel base but it does not have roads that connect it to the more southern areas, so most trips must go back through Cartago or San Jose! Traveling to beaches can be done on the weekends in between Spanish classes but most people just stay in the valley as there is a lot of hiking etc to do and the beach trips are really tight with usually just only one day to chill before traveling back again. Please remember that buses STOP running at 12:00 midday on the Thursday before Easter and do not start running again until Saturday. Most regular stores are closed on that Thursday and Friday, including bars and restaurants and the only transport available will be via taxis. Do buses run to the volcano or is it best to take a tour? There is 1 bus that runs to the volcano from Cartago and San Jose but it is best to take a tour as you will have a chance to stop along the way and visit many other areas that are not included in the local Bus tour.